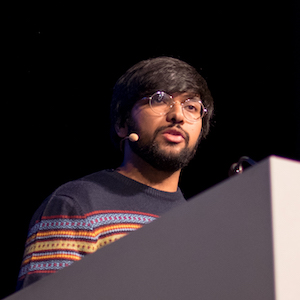 Computer programmer from India currently building enterprise products for the web. Tech speaker, open source software author and contributor. Creator of hyperpush.io. Community leader for React Delhi-NCR and Open Source Delhi. Plays drums (occasionally), loves travelling, listening to rock music and playing video games. Currently working on header bidding and various other ad revenue optimisation technologies at AdPushup Inc.
Talks and presentations from JSConf Iceland, JSConf Belgium, other conferences and community meetups. Utilities and modules written in ReactJS, AngularJS, NodeJS, Sass/CSS etc. that get 1.1M downloads every month!